- Ravine of the Raymond Cataract has been on my to-do list for several years, and this July 4th as the mountains were stuck in a brutal week long heat wave was the perfect opportunity to venture up it to check out the waterfalls. The plan was to do a recon hike on Tuesday, July 3rd, followed by a hike with Whitney, Kyle, and Todd on the 4th. - Pre WWII, there was a herd path by the waterfalls and then up through the brook bed to the Alpine Garden. 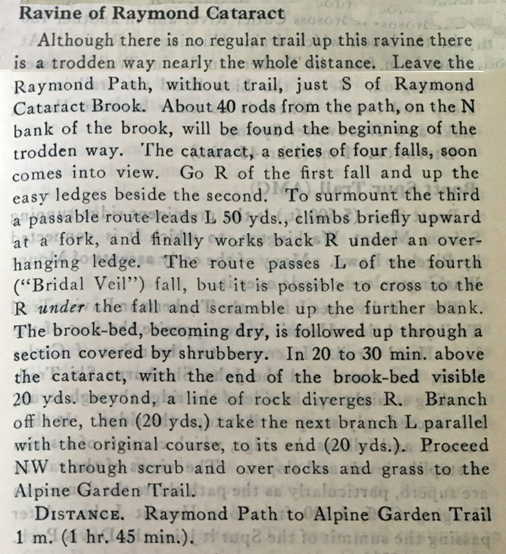 Pre 1955 guidebooks state, "Although there is no regular trail up this ravine there is a trodden way nearly the whole distance." and then it goes into a description of the route, see image below. 1955 to 1976 guidebooks stated, "There is no trail up the ravine. The following suggestions may be of some assistance but underbrush has completely covered the former footway." followed by the description from the old guidebook. Post 1976, there is usually just a blurb stating brush has covered the former path and falls can only be reached by skilled bushwhackers, also it mentions that water may be unfit to drink from summit building runoff, excellent! - Tuesday, I woke up early and had my feet on trail at 6AM, easily making my way up Tuckerman Ravine Trail, Huntington Ravine Trail, and Raymond Path to the Huntington Ravine fire road. From the fire road I stepped off trail at the brook leading to Raymond Cataract. I followed the brook, staying to the left of it up through mostly open woods and gentle grades, following a decent herd path for a few tenths of a mile to the lowest waterfall, where I crossed the brook and headed steeply up the right side of the cataract. - This is where the not-so-fun began, I kept getting dead-ended at a cliff ban that dropped auspiciously between the second and third falls. Twice I followed different routes of least resistance but twice I ended up here. So back down I went to the lower falls, recrossed and tried to head up left of the cataract, no dice! Again I was stumped, once by steep mossy covered wet rocks, and another time I was going too far to the left, so far left that if I had kept going I would have been closer to Lion Head winter route than the cataract. Attempt number five I headed back across the brook at lower falls and further right to an open glade that ended at a boulder field. I started scrambling up the wet slippery rocks and probably could have continued this way before making my way back over to the falls, but there was no way I'd feel comfortable taking three people up this way the next day, so I cut back over into the woods and figured tomorrow with more eyes on the whack we'd have better luck. - I felt defeated and just as I was about to give up I pushed over a random blowdown and looked up, bingo! What looked like a way to snake between the cliff ban and the boulder field appeared. As I started up I soon realized I was on the right path, and from here there were no more dead ends on the day. - With that being said I'll pick it up a day later with Whitney, Todd, and Kyle. As we snaked through this section to the upper falls, Whitney kept pointing out quite a few sawed off branches. The bushwhack was tight but since we were on what seemed to be a once semi-maintained tunnel we were able to maneuver our way up the steep parts easier than what I had expected. - Soon we came out at the crown jewel of the Ravine of the Raymond Cataract, Bridal Veil Falls and it's cascading waterfall. I carefully lead us to the overhanging falls and one by one we scooted behind the waterfall. It's a beautiful spot, from behind the cascading water you can make out the Wildcat Range across the notch. We stayed here for a few minutes before scooting back out from behind the falls. Next, Kyle found a way down to the bottom of Bridal Veil Falls, where we were greeted by a mini rainbow that we could reach out and touch. It was well worth the effort and difficult whack to get to experience this secluded waterfall. - After taking several photos and cooling off from the mist of the falls we carefully made our way back up the embankment into the woods. Above Bridal Veil Falls we paralleled the cataract until popping out at the top of the waterfall, from here we would travel the brook bed almost all the way up. - Hiking up the brook was refreshing and fun, it was very hot out so the cool water felt great and it wasn't too difficult rock hopping up the waterfall. We stayed away from the slimy moss and picked our way up carefully, even passing right through two mini waterfalls along the way. - Eventually, the water level dropped and we were traveling up a mostly dry brook bed which was slowly getting narrower as we gained elevation. Towards the top of the open brook bed we hit a patch of snow, maybe about twenty feet long and ten feet wide. Here, we put on our long pants as I told the gang things were about to get tight, not horrible, but definitely pants on time. - Above the snow patch we were traveling through stunted trees, luckily it was not pine, what we came up on reminded me of rhododendrons. The whack became thick but the branches from the trees were easy to move so it made the swimming up through the branches and leaves not horrible. However, we were still in the brook bed so we had to be extra cautious with our foot placement while doing this. It was a tricky few tenths of a mile until a short reprieve where the brook bed opens up before seemingly ending about fifty feet up ahead. From just below this end point we took a right and in ten feet we plopped out onto a U shaped talus field. We took a break here to get ready for what I called the ten minute knife fight! - To reach the rock hopping part of the Alpine Zone just below the Alpine Garden we needed to travel just over a tenth of a mile through some of the nastiest pines I've ever dealt with. They were stunted and so thick that we were several feet off the ground at times, just fighting our way through this wall of tangled branches and roots, trying not to twist an ankle from falling into a small void between whatever it was we were trying to balance on. Having done this the day before I was having a blast knowing it would only take ten minutes, I think the others enjoyed it as well, to an extent of course! - Finally, we emerged from the knife fight with a few battle scars but no worse for the wear. From here we rock hopped our way to the Alpine Garden Trail with ease. It was just after 10AM and steamy out, we all needed to resupply on water so we headed over to Lion Head and Tuckerman Ravine trails and made our way up to the summit. - As for Whitny, Kyle, and I. . . we joined our closest two hundred friends and headed back to Pinkham via Tuckerman Ravine, there were only a handful of hikers descending like us at 11:30 but well over a hundred ascending, it was crowded but almost everyone we saw was enjoying the mountain even if it was disgustingly hot out. - We made it back to the Jeep around 1:15PM, made the quick drive home, cracked open a beer, and sat in the Peabody River to cool off. Picture from my recon hike, twice I dead-ended here on the right side of the cataract, in between waterfalls. There was a huge slimy cliff band just to my right, and a hundred foot drop to my left! Whitney snaps a pic as I go behind the falls! We bushwhack down to the bottom of the falls and are greeted by a rainbow! Kyle takes a bite out of the rainbow!! Another refreshing cascade to hike up! The vegetation starts to enclose upon us, here comes the rough stuff! After a short reprieve through a small talus field, we head northwest into thick as hell scrub. I'm a few feet off the ground, walking on snarled branches in the left picture that Todd took. Whitney and Todd swim through the scrub, this section I deemed the "ten minute knife fight!" Pano from the Alpine Garden. This pic is two of Todd's pics combined that I ran through photoshop. The headwaters for the Ravine of the Raymond Cataract (Todd's pic). "This water is unfit to drink, as it consists largely of drainage from the summit house." - 1936 AMC White Mountain Guide . . . "This water may be contaminated by drainage from the summit buildings." - 2017 AMC White Mountain Guide. Yikes! BTW Chris, if you get the two brook crossings correct there is no bushwacking involved on the way to the Bridal Falls with exception of the initial entry on the south side off Raymond. In your Recon photo describing dead ending twice, the last crossing from north to south over the brook is a bit below you at the base of falls (as described re the "Egg Rock" Upon crossing the brook the trail winds upward a bit then a scramble up a chute that puts you on top of the rock face in your pic - opposite side from your vantage point. The trail winds from that point through cleared krumholtz like head high spruce & ultimately to the fall. I first climbed it back in the early 70's & after visiting the falls we followed the remnants of an old trail south from near the chute to the Lions Head winter route? (been awhile HaHa) home. Sorry for the delay in responding back and thank you so much for the info! From my research I knew I should have crossed over again to the south side but I just couldn't figure out where to drop back down, I'll definitely go back and find the solo egg rock. The rough herd path that I eventually stumbled upon on the north side wasn't too bad but I really wanted to be on the south side. I believe I read on VFTT that the the herd path I was on was cut about ten to twelve years ago but I'm not positive. The path on the north side is definitely narrow but made it easy to ascend to Bridal where it was not too bad to shuffle over to the falls. Still, I look forward to finding your route, thanks again for all the info, much appreciated! !